Chandrika Ayurvedic Soap, 2.64 oz. 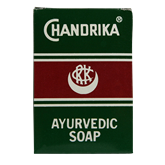 Chandrika Soap is one of the more famous soaps based on the 4000 year history of Ayurvedic medicine. It is made from pure coconut oil and blended with hydnocarpus, lime, orange, patchouli, sandalwood, and wild ginger. The oils are cooling to the skin and help prevent rashes and infections. The soap produces a rich lather, even in the hardest water. Chandrika Soap has become famous for its cosmetic and healing properties. It is free from any kind of animal fat or artificial additives. It is 100% natural and has never been tested on animals. Ingredients: Coconut Oil : it nourishes, moisturises and lightens your skin tan. Wild Ginger : soothes the skin and helps prevent infections and rashes. Lime Peel Oil : for a refreshing cooling effect and rich, penetrating lather with an astringent action. Hydnocarpus Oil : helps prevent skin problems, rashes and outbreaks. Orange Oil : tightens pores, helps prevent pimples and blackheads. Sandalwood Oil : to cool, refresh and gently prefume your skin. Chandrika Sandal Soap, 2.64 oz. Extracts from sandalwood and pure coconut oil cleanse and refresh the body, while moisturizing the skin, keeping it soft, supple and gently perfumed with the natural aroma of sandalwood. Ingredients: Coconut Oil, Sodium Hydroxide, Palm Oil, Wax, Soap Stone Powder, Mixed Essence, Cos Oil Green, Water. 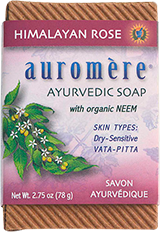 Himalayan Rose Soap, Auromere, 2.75 oz. This is a highly fragrant Ayurvedic soap formulated with a natural coconut oil base that provides a rich creamy lather that gently softens and conditions the skin as it cleanses. It is free of animal fats, artificial fragrances, color or preservatives. As the name suggests, the Himalayan Rose Soap has a floral aroma, like perfume. Ingredients: Coconut oil, palmyra oil, water, alkali, castor oil, hydnocarpus (cactus) oil, rose compound, sesame oil, Indian beech oil, Indian butter (Mashuca indica) oil, damascus rose petals, zedoary, hibiscus, fenugreek, tulsi (holy basil), sandalwood, henna, almond, and vetiver. 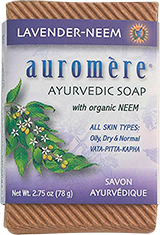 Lavender Neem Soap, Auromere, 2.75 oz. This soap is balancing for all doshas. It combines the soothing properties of neem with the restorative properties of lavender and is toning to the skin. Ingredients: Coconut oil, palmyra oil, water, alkali, castor oil, Hydnocarpus (cactus) oil, lavender compound, neem oil, sesame oil, Indian butter (Madhuca indica) oil, turmeric, sandalwood, Hibiscus, Bael leaf, Indian soapnut, zedoary, fenugreek, mung bean, indigo and Alangium salvifolium. 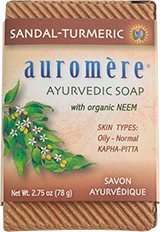 Sandalwood-Turmeric Soap, Auromere, 2.75 oz. Sandalwood-Turmeric Soap is formulated for skin that is normal to oily. It is recommended for those with pitta and vata constitutions or whose skin is blemished. Ingredients: coconut oil, palmyra oil, water, alkali, castor oil, sesame oil, hydnocarpus (cactus) oil, sandalwood oil, neem oil, rice bran oil, indian beech oil, Indian Butter Tree (Madhuca indica) oil, neem bark, dhub grass (Cynodon dactylon), Indian gooseberry (Amla), turmeric, peepal (bodhi tree), celastrus seed, Corallacarpus epigaeus, nutgrass, zedoary, Indian madder root, costus, mung bean and fenugreek. 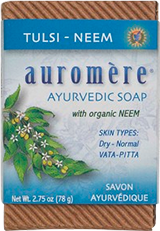 Tulsi-Neem Soap, Auromere, 2.75 oz. Combines the excellent toning, soothing and purifying properties of Neem with Tulsi and 16 other complementary herbal extracts and oils used for centuries by Ayurvedic specialists for optimum care, moisturizing nourishment and preservation of the skin. For dry to normal skin and vata-pitta type constitutions. Ingredients: Coconut oil, palmyra oil, rice bran oil, alkali, water, neem oil, hydnocarpus (cactus oil), castor oil, tulsi (holy basil), rose petals, zedoary, turmeric, fenugreek, psoralea corylifolia (babchi seed), peepal (bodhi tree), alangium salvifolium, costus, Indian sarsaparilla, Shiva neem (a variety of neem), hibiscus. 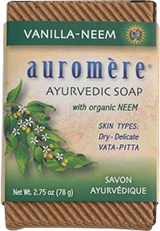 Vanilla Neem Soap, Auromere, 2.75 oz. This fragrant soap is specific for delicate and aging skin and helps to correct both vata and pitta imbalances. Ingredients: Coconut oil, palmyra oil, water, alkali, castor oil, Hydnocarpus (cactus) oil, vanilla compound, neem oil, sesame oil, Indian beech oil, Indian gooseberry (amla), sandalwood oil, Hibiscus, henna, vetiver, zedoary, fenugreek, mung bean, indigo and rose petals.